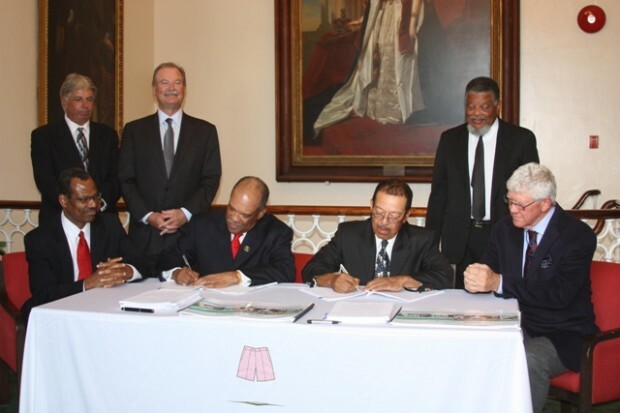 This afternoon [Sept 13] another step was made in the much discussed ‘land swap’, with the principals of Southlands and the Bermuda Government meeting, and signing a formal agreement. The agreement will see a luxury resort built at Morgan’s Point, while Southlands will become a park. I wish to join with the Premier in expressing optimism and excitement about the luxury resort, golf course and other amenities that are planned for Morgan’s Point in Southampton. I have no doubt that the proposed new development will do much to enhance our Island’s tourism product and assist in ensuring that Bermuda remains a destination of choice in world tourism. The Exchange Agreement that is to be executed today between the Government of Bermuda and Southlands Ltd. is a prerequisite in making the new tourism development a reality. As the Premier has already indicated, it is the Government‘s plan to proceed with the Morgan’s Point Resort Bill 2010 during the next Legislative Session, thereby giving legal effect to the exchange of lands between Government and Southlands Ltd. The Bermuda Land Development Company Limited, within whose remit the land at Morgan’s Point currently falls in accordance with provisions of the Base Lands Development Act 1996, is pleased to make this precious tract of land available to Southlands Ltd., some freehold and the vast majority via leasehold, as the land exchange clearly demonstrates key aspects of the mandate of the BLDC – to foster Bermuda’s tourism, to promote job growth for all and to pursue strategies that are good for the people of Bermuda. On Saturday evening, the Premier said that the period of his Premiership has been one of execution and action. Mr. Premier, there can be no doubt that the extremely important Exchange Agreement that is to be executed shortly results in no small way from your daring to dream about a glorious future for Bermuda’s tourism product and for your commitment to chart courses and pursue actions that will ensure that those dreams become a reality. We thank you for that, Mr. Premier. And we also thank Southlands Ltd. and its partners, Mr. John Ryan and Mr. Egbert Perry, for their commitment to the long term viability of our Island’s critically important tourism product. Good afternoon and thank you for joining us. In June 2009 the owners of Southlands Ltd. partnered with Mr. John Ryan and Mr. Egbert Perry to determine a vision for the development of a luxury, resort hotel product at the site known as Morgan’s Point. 15 months later we are here today to take two key steps forward in the realisation of that vision. In record time, against the background of global economic challenges, magnified in hotel investment, the Government of Bermuda is still able to inspire confidence in the marketplace and deals like this one can be advanced through these critical stages. Confident in our mutual ability to meet certain conditions under our Agreement, I am proud to fulfill our promise to the people of Bermuda to preserve Southlands and take another step towards formally making that land a national park. The Exchange Agreement we execute today is further evidence of this Government’s real environmental credentials which are based in sustainability not blind preservation at the expense of necessary economic enhancement. Although the ultimate passage of the Act of the Legislature required to fully address the technical aspects of these lands will not be my work, I am pleased to have joined with my colleague Minister Burgess in taking the matter through Cabinet and confirm that the Attorney General’s Chambers continue to draft the legislation. I am confident that the Morgan’s Point Resort Bill 2010 will be among the first matters considered when the House returns. This development will receive significant scrutiny as it proposes to occupy the last large tract of land ripe for tourism development. We have conducted detailed negotiations and the Government has adjusted policy positions to ensure the success of this project. We understand that in today’s world, only flexible and innovative jurisdictions will effectively compete for the next wave of resort development. Bermuda is on its way to positioning itself for significant tourism success. Projects like this at Morgan’s Point will lead the way in that effort. In 2005 Bermudian businessmen Craig Christensen, Nelson Hunt and Brian Duperreault bought the estate from the Willowbank Foundation and planned to develop a tourist resort, which was met with resistance from segments of the public who wanted the property to be retained in its natural state. The 37 acre Southlands property dates back to at least the 18th century and many of its most unusual features were created by early 20th century owners James Morgan and Brigadier Maconochie. Southlands is pictured below, and you can view a full photo gallery of Southlands here. I hate that I’m suspicious of the timing of this transaction and the cast of Government characters involved. I can’t help but think that both he and Mr. Burgess forced some juicy tidbits in this transaction for themselves in exchange for getting the deal done before he leaves office. Its a really strong bargaining chip given all the money that the investors have sunk in this deal to date. Not only that but the uncertainty surrounding the fact that we don’t know who the next Premier will be and whether or not they will go for this deal or not makes it even more risky for the investors to not do the deal on his terms vs not doing the deal at all and losing a significant investment.